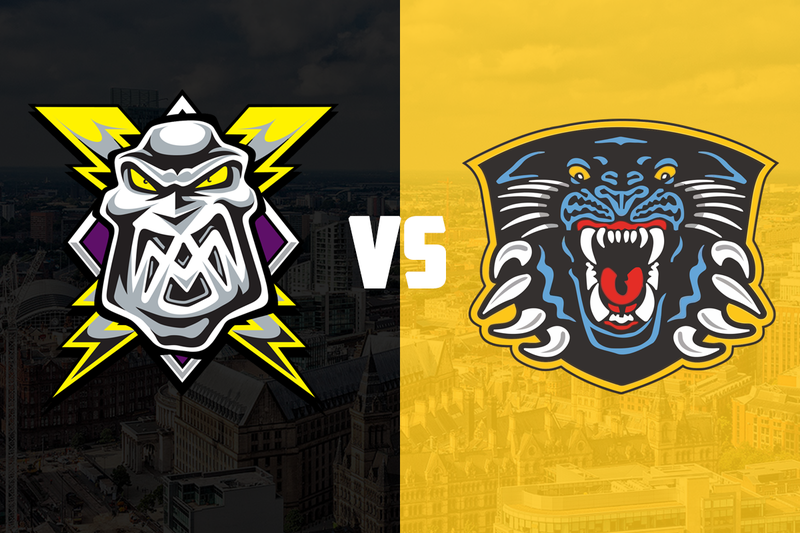 Your Go Goodwins sponsored Manchester Storm are back in Elite League action this Saturday as the Nottingham Panthers travel to Planet Ice Altrincham in a 7:00 pm faceoff. It was a tough weekend for both sides last weekend, with both teams failing to secure a point. The Storm welcomed the Belfast Giants to the Storm Shelter on Saturday night, in a tight game that went to the wire. Despite goals from Nate Fleming, Matt Beca, and a Mike Hammond double, it was the Giants who eventually prevail 6-4 thanks to two goals in the last 75 seconds. The Panthers faced Cardiff at home, in a game that ended 2-1 in favour of the Devils, Zack Phillips getting the solitary Panthers marker. The Panthers travelled to Guildford on Sunday, but went down 5-2 in Surrey with the Flames grabbing two empty-net goals. Robert Farmer and Brett Perlini scored the Panther goals, while netminder Patrick Galbraith picked up an injury during the game and is doubtful for this weekend. Manchester faced Dundee on Sunday, going down 5-3 away from home. Dane Byers, Mike Hammond, and Scott Pitt scored the goals for the Storm in a disappointing night. This is the first league meeting between the sides this season, however they have faced each other twice in the Challenge Cup. Manchester travelled to Nottingham in the last weekend of September, and it was the Panthers who prevailed on the evening, 3-2. Dan Spang, Yann Sauve, and Evan Mosey scored the goals for the Panthers, while Dane Byers and Matt Beca scored the Storm goals. Mosey is another doubt for this weekend, after picking up an upper-body injury recently. Storm gained revenge in the return fixture, winning 5-3 at home. Matt Beca, Matt Stanisz, and a hattrick from Luke Moffatt were enough to secure both points for the Storm, as Robert Farmer, Mark Derlago, and Jeff Brown goals were not enough for the Panthers. One to watch: Yann Sauve joined the Panthers from German DEL team EHC Munchen, and has started the season well adding some offensive flair to Nottingham’s blueline. Storm will be in their BLACK home jerseys for the game.